HP Photosmart 8250 ink-jet photo printer features Scalable Printing Technology (SPT) which incorporates lots of advancement and improvement to printer technology, including new ink delivery system with 6 individual ink cartridges, and ink recirculation technology to minimize priming waste. PC Magazine selected HP Photosmart 8250 as Editor’s Choice printer with rating of 4 out of 5, and concluded that for photos, the HP Photosmart 8250 Printer offers fast printing and quality at the high end of very good, making it an excellent choice as a low cost photo printer. 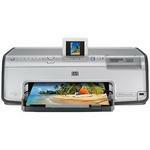 It also handles text and graphics well, making it a good pick as a single, all-purpose printer as well. Pros: High-quality output. Good performance. Separate 4- by 6-inch tray makes it easy to switch between printing letter-size documents and 4- by 6-inch photos. Cons: Text quality, while good, is low for a photo ink jet. Photos are water- and smudge-resistant, not waterproof or smudgeproof.